Professors John Kemeny and Thomas Kurtz at Dartmouth College in New Hampshire write a high level "compile and go" language called Basic and place that listing (written in assembly language) in the public domain. It initially ran on Dartmouth's General Electric 225 mainframe computer. GE-225 mainframe computer — running a new interactive time-sharing operating system that Dartmouth College writes for its students, later called the Dartmouth Time Sharing System (DTSS). Click here for more details. program language 8-bit Microsoft Basic was the first Basic interpreter, written by Bill Gates & Paul Allen using a cross assembler program and an Intel 8080 emulator on a Digital PDP-10 minicomputer at Harvard. Runs in just 4kb ROM as Altair Basic. uses source written in C. 16-bit Xenix, a multi-user, multi-tasking PLATFORM, developed on Digital VAX and Digital PDP-11 computers. Licensed to OEMs by issuing assembly code relevant to each processor. Also used for in-house development. Licenses for Intel, Tandy, Altos and SCO. SCO release it for the IBM PC in Sep.1983. Click here for its bootup sequence. Click here for Assembly Code and comments re version 1.0 of IBMBIO.COM. 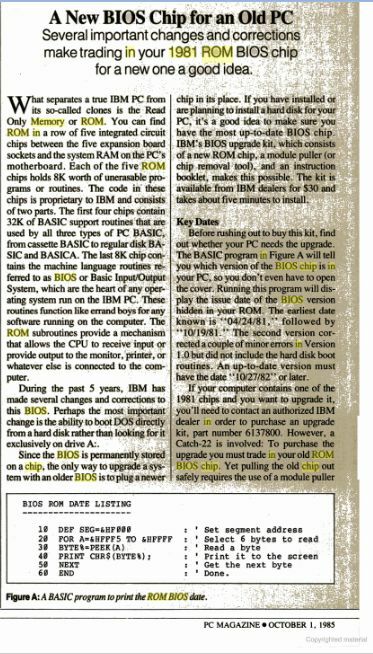 Click here for the original ROM BIOS Assembly Code Listings published between 1981 and 1985. The first listing includes its original font character set, each with an 8x8 (64 bit) pattern. AMD — Applied Micro Designs became "second-source" manufacturer for Intel's patented x86 chip. With this guarantee, the IBM PC was launched with VisiCalc for spreadsheets importantly , Microsoft Adventure for games, EDLIN for a built-in line editor, Easywriter for Word Processing (but fairly unpopular), Peachtree Accounting for businesses and dBASE II for database developers. For extra help built in, it came with a "Prt Scn" key that printed the screen image from the display buffer, three versions of Microsoft Basic: BASIC and BASICA (Advanced) on diskette, and Cassette BASIC in the ROM BIOS if no diskette loaded. In April 1982 Wordstar was ported to the PC and rapidly replaced Easywriter. AT&T broken up, to go into computers. In May, PC-DOS 1.1, then MS-DOS 1.25 added support for 360kb disks. In July, their in-house LAN running Xenix for email. IBM Compatibles — Compaq, Columbia on 8086 with 16-bit data bus & 320kb disks. AT&T markets Unix, competes with Xenix, but owns the standard. In January 1983, Lotus 123 was launched as a "killer" spreadsheet application with more functions and commands. Accountants everywhere encouraged businessmen to learn its features. In March, PC-DOS 2.0 and MS-DOS 2.0, supporting a 10mb hard drive, sub-directories (folders), pipes, redirection & other Unix-like features. Novell & Laplink launch using TSRs. In May 1983, the Microsoft Mouse and Notepad were launched, followed by Microsoft Word in October 1983. Microsoft talks to IBM regarding a new GUI, multi-tasking platform In Aug84, PC-DOS 3.0 and MS-DOS 3.0, supporting a 32mb hard drive. In Nov84, file-and-record locking controls added in MS-DOS 3.1. IBM authors NetBIOS using SMBs on IBM's Token Ring network. MS-Net launches on a dedicated server. Tries to compete with Novell. But not very well. Word with its graphical user interface was ported to the Apple Macintosh in January 1985. Then in September 1985, a spreadsheet program, Microsoft Excel, designed for the Macintosh in the days when Microsoft were still on good terms with Apple. Excel didn't come to Windows until late 1987. 16-bit IBM AT with 80286 processor, 1.2mb 5¼" disks, a 20mb Hard Drive, and an "enhanced" keyboard layout now in use everywhere. Approx $AU5,000-$8,500. Compatibles cheaper but compatibility issues arise. Click here for extra history 16-bit Windows 1.0, mostly written in C, runs on MS-DOS 2 & 3 using 256kb - 512kb RAM. Offers multi-tasking. But the memory maximum is still 1mb, and tasks need explicit programming to share processing time & memory. Apr 1987 PC-DOS 3.3 with 3½" 1.44mb disk support and extended partitions IBM's 16-bit computer is released in April 1987, the IBM Personal System/2 (PS/2) with 1.44mb 3½" disk, VGA screen & PS/2 mouse. Runs PC-DOS & Windows. Windows 2.0 16-bit Windows 2.0 runs on MS-DOS 3, still with 1mb limit, but now DDE (Dynamic Data Exchange). Lantastic P2P launch. MS-DOS 3.31 for Compaq now supported Hard disk partitions over 32 MB IBM's new operating system OS/2 v1.0. Stays 16-bit for the PS/2 286. Text mode display. 3Com (Ethernet cards) write LAN Manager. Jul 1988 MS-DOS 4.0 with DOS Shell File Manager and 32mb EMS 4.0 (Expanded Memory option) OS/2 v1.1 on PS/2 in Oct 88. Now GUI. Program Manager and now Protected memory support. In Oct91, Multimedia extensions added in 3.00a 3Com bows out. System unravels when IBM insists Windows be dropped. Instead, Microsoft recasts OS/2 3.0 as Windows NT. Windows 3.1 16-bit Windows 3.1 with Apple TrueType fonts, OLE. In Oct92, 16-bit Windows for Workgroups (32-bit in Aug93). Samba launch. 32-bit OS/2 2.0 in April 1992 by IBM solo. Supports multitasking of DOS / Windows. Mar 1993 MS-DOS 6.0 included Double Space compression and further utilities. Visual C++ and the MFC Wrapper Library COM: Model for interprocess communication. Clients to access Components (as Objects) via a binary interface's unique GUID. In 1994, introduced visual OLE controls. Then, in between Visual Basic 4 & Visual Foxpro in 1995, and Visual J++ in Oct96, technology renamed ActiveX. After the disagreements over the previous 8 years, the clean break with IBM offered Microsoft a new start, culminating in Windows XP, 8 years later. Click here for a humorous 1993 email, possibly from IBM. 1993 NT 3.1, 1994 NT 3.5, 1995 NT 3.51 32-bit Server and Desktop. NT stable but limited in hardware/ games. Jun 1994 MS-DOS 6.22 becomes last MS-DOS release with DriveSpace disk compression, following a legal injunction against DoubleSpace. 16 & 32-bit Windows 95 running on MS-DOS 7. Still included 16-bit Win3.1 code to run numerous 16-bit Windows games. New addition was the free IE Browser. Shortly after, in 1996, Microsoft implemented the object-oriented software interface — ActiveX, and PPTP for tunneling over the web. Became the most successful operating system ever. 32-bit PC. Easy to use though a little more unstable. Windows NT 4.0 32-bit Windows NT 4 with CIFS, a new name for SMB. In May97, ASP — Active Server Pages. In June98 Terminal Server. Server and Desktop. Windows NT 5.0 32-bit Windows 2000. Server edition now uses Active Directory. Server and Desktop. Windows NT 5.1 32-bit Windows XP both stable and easy to use. 64-bit edition also. Windows NT 10.0 64-bit Windows 10. 32-bit edition also. Windows XP looks like being around for some time to come - much to Microsoft's disappointment - given how much time - and money they've spent on Vista. In 2013, about 315 million PCs were sold globally, with † 91% running some version of Microsoft Windows, 7% running Mac OS X, and the rest on Linux and other systems. † Click here to see these percentages, also a breakdown of operating systems used in web servers, mobile devices (i.e. smartphones and tablets) and mainframes. The takeup rate for Windows Vista can be seen to have been much lower than Gartner estimated. In June 2014, Windows XP accounted for about 25% of market share, with Windows Vista on just 3%, Windows 7 on 50% and Windows 8 on 13%. In May 2014, Microsoft's increasing lack of openness within Windows 8 meant that the Chinese Government banned Windows 8 from all Chinese government purchases. They had had considerable access to Windows 7's source code. As part of efforts to "re-engage" with users in China, Microsoft announced that it would partner with Qihoo and Tencent to help promote and distribute Windows 10 in China, and that Chinese PC maker Lenovo would provide assistance at its service centers and retail outlets for helping users upgrade to Windows 10. Apple (click for key dates) retain proprietary rights by always writing their own software and building their own machines. They cater to a niche (and loyal) market worldwide, historically in desktop publishing, graphics, sound, and research i.e. cutting edge development. Linux, on the other hand, is an open source operating system, based on Unix-like commands, and originally written in 1991 by Linus Torvalds. Accordingly, companies can only claim ownership rights to their version of the operating system, as each one carves out its own niche. For all its difficulties, the biggest strength of Microsoft through the years, I believe, has been continuity of data service: i.e. numerous software packages with accompanying file structures written with earlier versions of MS Windows have been regularly supported in later versions of Windows - at times for years into the future. It is this continuity that provides assurance to the vast majority of business companies and individuals who rely on Microsoft, and is doubtless a lesson Microsoft learned from the original computer companies: IBM, NCR, etc. This continuity of service, incidentally, many times does not apply to old hardware. This was the source of a major difficulty between Microsoft and IBM during that period 1985-1990, given the enormous investment that businesses had made, and were still making, in 16-bit IBM 80286 and older XT computers, expecting ongoing support. Not so much an issue to Microsoft of course, who don't sell business computers. But coming back to today, for this reason it has been recommended that users only ever upgrade their version of MS Windows when purchasing a new computer — or when the computer they own is less than 12 months old. As it says, Windows 9x is the generic term referring to the series of Microsoft Windows computer operating systems produced from 1995 to 2000 i.e. And according to this page https://en.wikipedia.org/wiki/Windows_10 Microsoft have been referring to their next version since Windows 8 as "Threshold". It was only speculated that it would be branded Windows 9 on its release, but I guess that might have been a bit ambiguous when referring to those earlier versions. On September 30, 2014 it was announced that "Threshold" would be called "Windows 10". I guess it saves that ambiguity, but, like happened with yourself, it's still only going to cause more questions about "What happened to Windows 9?"